Following our regular releases, which are every six months or so, we regularly release minor updates. These updates generally contain important bug fixes. So it is always important to ensure that you are using the most updated version of a major version. (please note that MacVector 10.6 is an update for all MacVector 10.5 and above users). Incidentally whereas our policy for major releases is intensive testing with minor updates we prefer to get these out to users very quickly. This will appear periodically whenever there is a new release. 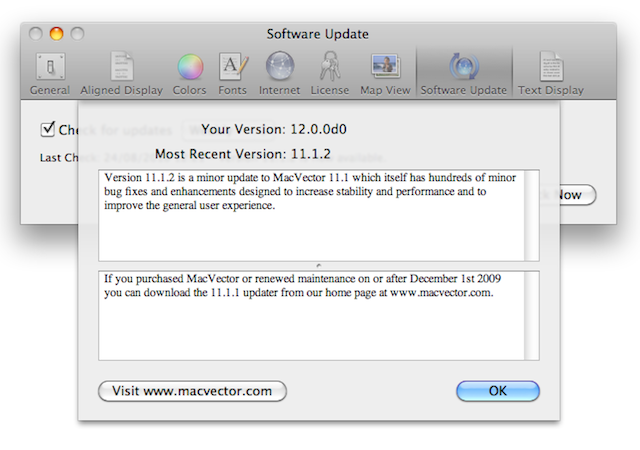 However, you can manually check by navigating to MACVECTOR PREFERENCES > SOFTWARE UPDATE and clicking CHECK NOW. However, there are other ways to stay up to date. There’s the MacVector forums where as well as discussion we will post details of new releases. You can also subscribe to our RSS feed to be kept updated on all MacVector news. ..and of course there’s this very blog where we publish will generally publish whenever there’s a new release.